Link to my Google Scholar page here. Maddie is interested in environmental and social stress, social networks, and the effects of all of the above on dispersal behavior and fitness, using brush mice (Peromyscus boylii) as her current study system. Her M.S. research focused on habitat-specific fitness in degus (shown here). Valerie is interested in conservation genetics, and is completing independent research projects on population genetic structure and extra-pair paternity in song sparrows across an urbanization gradient, in collaboration with the Sewall lab at Virginia Tech. Valerie is majoring in Conservation Ecology with a minor in Genetics. Tina is interested in variation in social behavior, social network approaches, animal personality/behavioral syndromes, and dispersal. Link to her webpage here. Gizelle's dissertation focused on the influences of urbanization and habitat fragmentation on small mammals, particularly how urbanization affects individual behavior, population genetic structure, and parasite load in populations of Merriam's kangaroo rat in and around Las Cruces, NM. She is now an Assistant Professor at Clovis Community College. 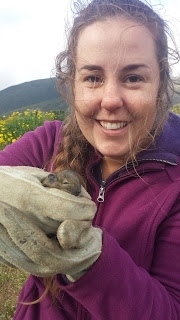 Rebecca investigated how environmental and social stress during early development affect behavior, stress responses, and species coexistence in free-living Peromyscus species in northern California. Rebecca also completed "data science bootcamp" with the Data Incubator, and is now a data scientist with Amazon in Seattle. Katie's MS research investigated the response of endangered salt marsh harvest mice to tidal influences in the San Francisco Bay Area. Katie is now an Ecology postdoc at UC Davis. Dana's thesis explored the effects of previous habitat experience and individual variation in boldness on habitat preferences in brush mice. Dana is currently employed by the Albuquerque Aquarium. Chris's MS research focused on the influence of spatial variation in population density on individual dispersal decisions. Chris is currently employed by NEON. Liberty is now a curatorial assistant at the Virginia Museum of Natural History. Kristen's MS research focused on the interactions between small mammals and their predators, and how those interactions may influence state transitions from grassland to shrubland in the Chihuahuan Desert. Kristen is now a game warden in Wyoming.